Are you a twin? - No. I don't even know this guy. We've never met. If I punch you then does your twin feel it? - If I punch you will you come up with a decent question? Are you the evil one? - Yes. I'm a psychopath and I'm plotting to kill everyone everywhere. How do you tell the difference? - I don't. Sometimes I wake up and I'm like: "Am I myself or my twin?" Who's older? - twin: noun, one of two children or animals born at the same time. I like your twin more than you (I know it isn't a question) - I like my twin more than you and I hate my twin with all my heart. What's it like to be a twin? - What's it like to have no imagination? I wish I had a twin - I wish I could hit you with the a massive hammer but, sadly, we can't always do what we want. Are you telepathic? - Are you telepathic? I bet you're sick of hearing this but... - ...But you're going to ask it anyway? I’LL KILL EVERY LAST STINKING ONE OF YOU!!!!! 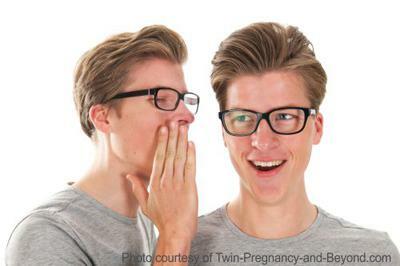 Most of these questions don't apply to "non-identical twins" because they aren't twins. They are siblings born at the same time. Twin is a synonym of identical. Non-identical twins are just normal siblings. Return to SILLY QUESTIONS - Submission Page.